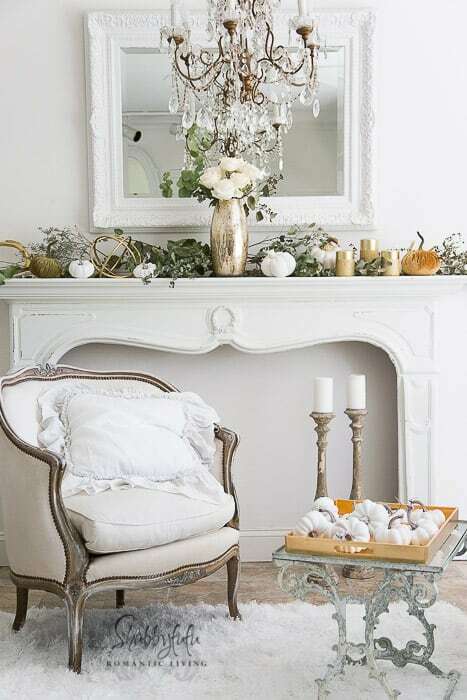 Elegant mantel decorating ideas are the topic of this post. 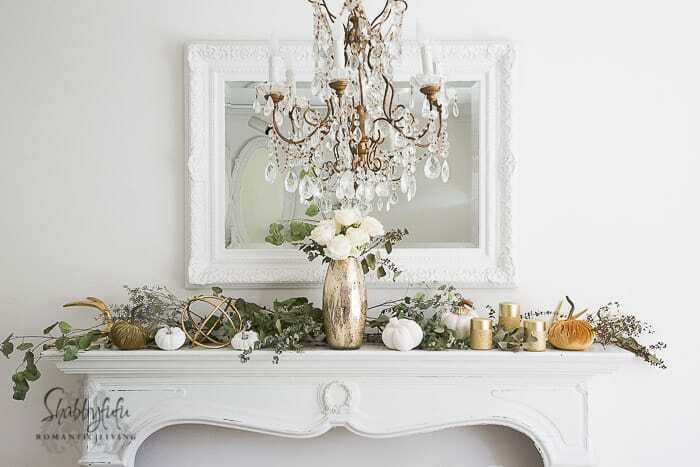 Mantels can be the focal point of a room and seasonal design is simple when sparingly styled with items you love. 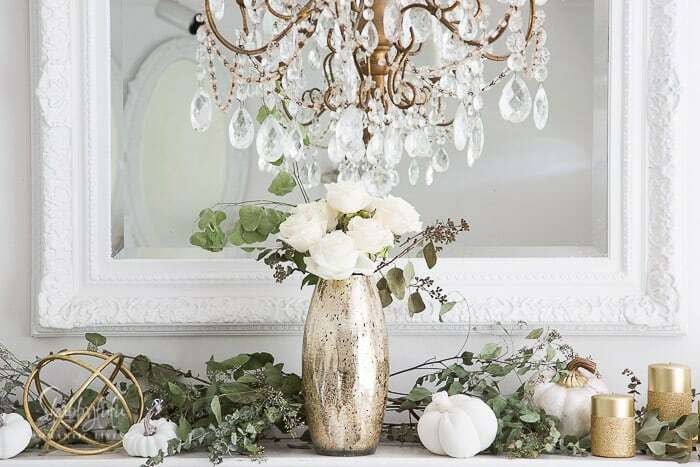 for fall in white, metallic mixes and of course some greenery. I’m partying with some talented bloggers today and will post their links below. 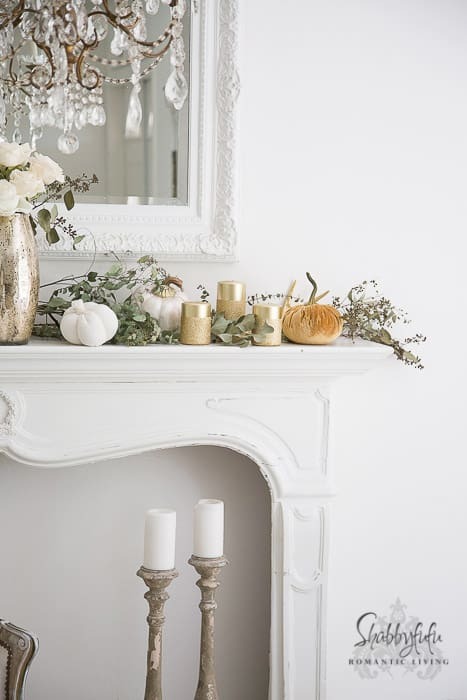 As per usual around here, I start most of my styling thoughts with flowers. Last week there just weren’t a whole lot of options available (my florist is sadly closing shop:-(( so I purchased a dozen white roses at the grocery. 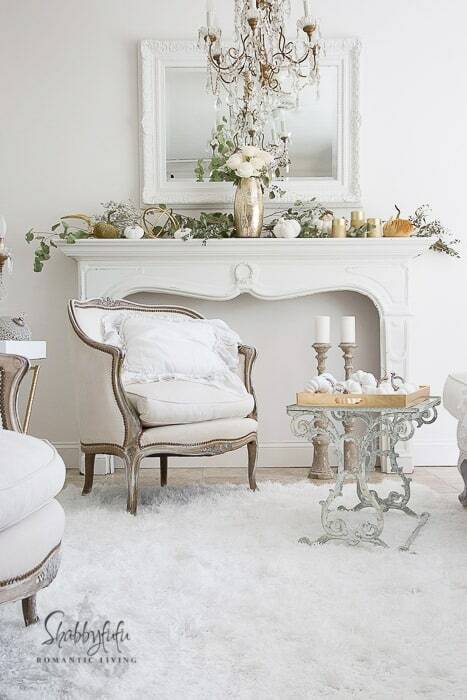 Knowing that my favorite palette is white, especially for the living room…I knew that the white roses would work. 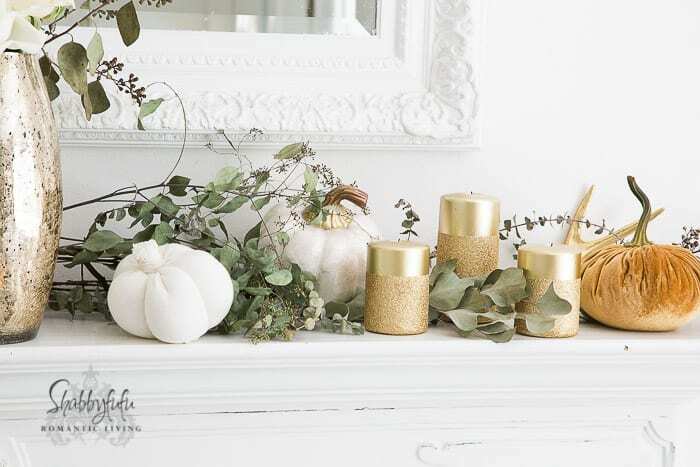 I styled the mantel with mix of those white roses and eucalyptus that is from a couple of weeks ago, a few faux white pumpkins and gold glitter candles. STYLING TIP: Hang on to your eucalyptus for as long as you can and use them as dried arrangements! 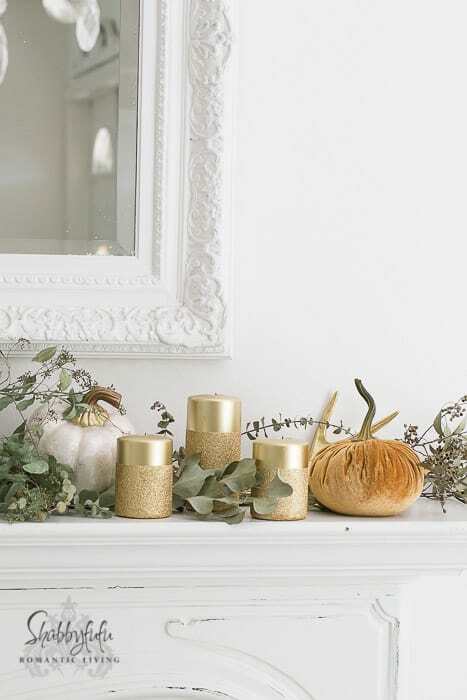 They are a bit messy, but as long as you don’t mind sweeping up after creating with them they look beautiful with their pale silver-green hues. 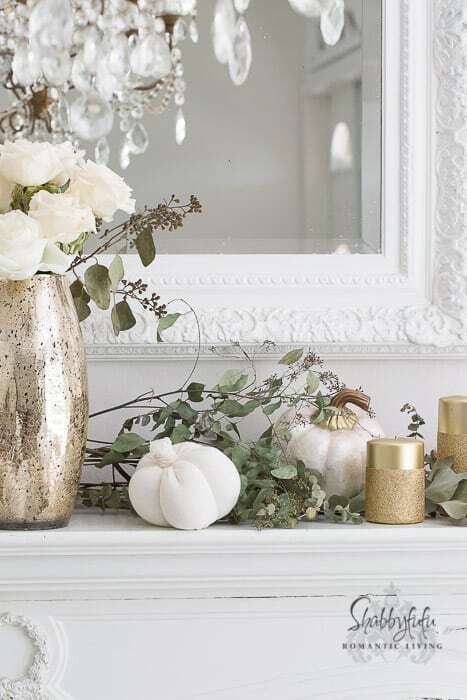 The GOLD crackle vase is quickly becoming a favorite of mine and I love the modern touch that it brings to the vignette. I sure do wish that pumpkins were available earlier down here in the tropics, but my husband said that he just now noticed a display up at Home Depot and it’s the first that I’ve hear of around town. It’s 100 degrees here today…and we just DO NOT EVER have fall! 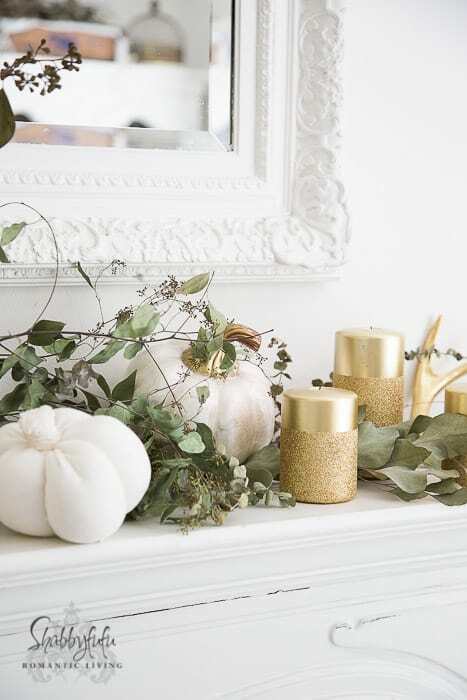 I’ve kept it light and bright on the MANTEL and will likely leave it this way for awhile. 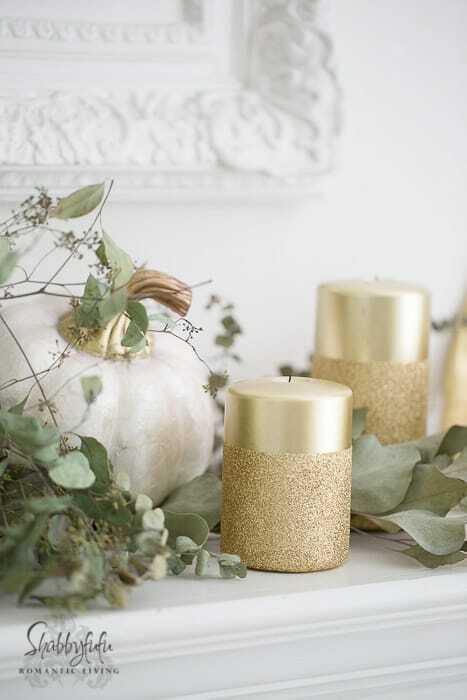 Most of the accessories are from At Home stores and if you like the look you can probably find them locally of you have one close by. 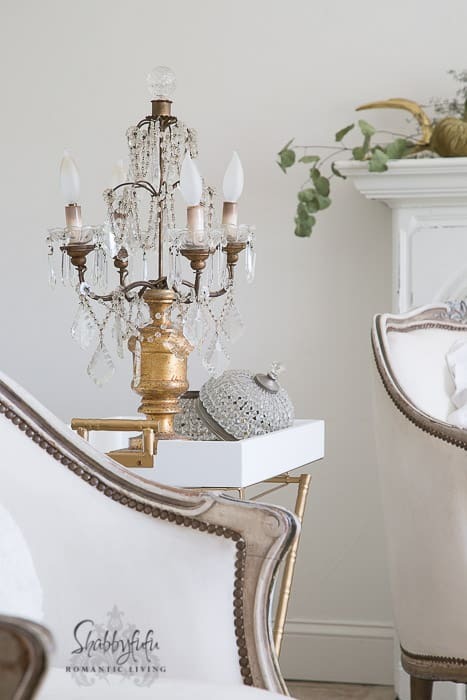 I like to call my look French Vintage Modern if that makes sense, and mix up antique French pieces with modern touches like the butler tray table you can see peeking out. The chairs are antiques and there are lots of similar looks in newly made, like this BERGERE CHAIR and this French style LIMOGES LADIES CHAIR that is really affordable. 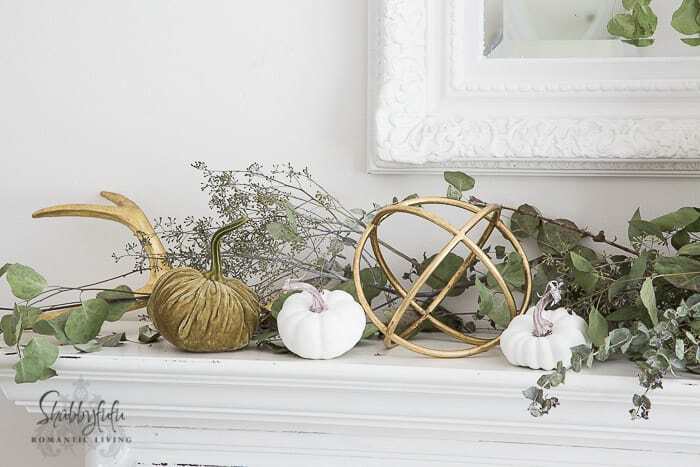 The GOLD ORB I love to display visually opens up the space and the GOLD ANTLER at the end of the MANTEL does that as well. I am going to remain silent for a few more photos and let them talk to you. Keep scrolling though…I’d love for you to see my friend’s links as well. 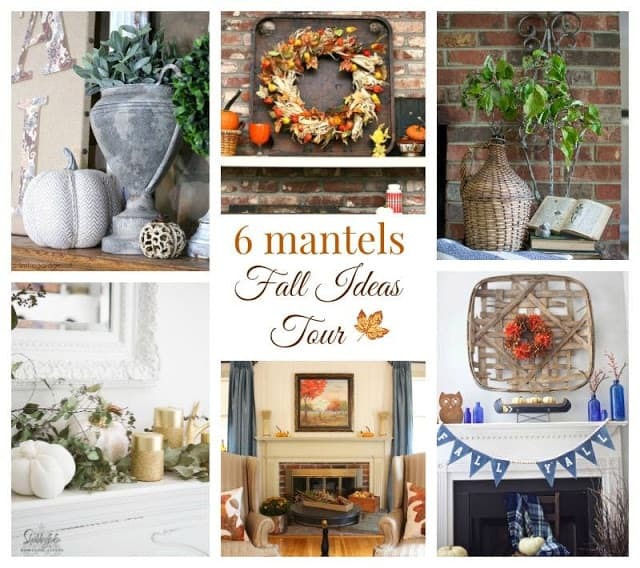 I hope that you visit all of the days on this tour for some AMAZING inspriation from such talented blog friends!